The Seeonic team is excited to partner with atlasRFIDstore to take RFID directly to the Internet of Things (IoT). Seeonic, leading supplier of Untethered RFID™​ technology, has teamed up with leading RFID solutions market supplier atlasRFIDstore to expand the sales of its cellular RFID readers and accessories to the Americas market. Under the new partnership, atlasRFIDstore will offer Seeonic’s SightWare®​ ​ family of ultra low-energy, battery-operated, high performance cellular RFID readers. Atlas will also offer Seeonic’s wide-beam EYE antennas, rechargeable battery products as well as special SightWare®​ ​ starter kits that include all materials needed for quick development via easy-to-use cloud APIs. Seeonic products are now available for purchase at ​https://www.atlasRFIDstore.com/Seeonic. Based in Minneapolis, Seeonic is the leading provider of Untethered RFID™​ ​ enabling UHF RFID solutions in use cases never before possible. 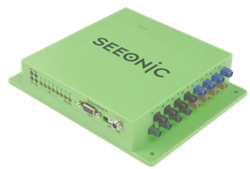 Seeonic’s SightWare®​ ​ family of IoT RFID readers operate autonomously within fixtures, mobile carts, vehicles and field locations, delivering unprecedented enterprise visibility using battery power, onboard GPS and robust cellular communication. Seeonic technologies have been industry-recognized several times in the Best Implementation and Best Product categories. Visit Seeonic's website at http://www.seeonic.com. atlasRFIDstore is the leading supplier for RFID readers, tags, antennas, and accessories. Established in 2008 and located in Birmingham, Alabama, atlasRFIDstore provides its customers with a secure source for enterprise RFID hardware and tags. By developing personal relationships, creating educational guides and videos, and providing white-glove service, atlasRFIDstore delivers a value-added experience to its customers. To learn more about atlasRFIDstore, visit ​https://www.atlasRFIDstore.com​.